Here comes juicy, slow-roasted cooking. 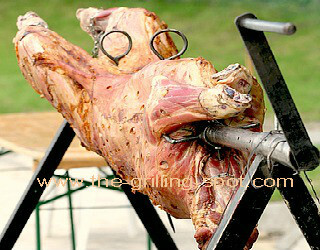 Rotisserie grilling is also referred to as spit roasting. 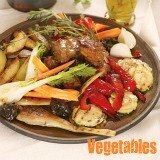 In this slow cooking process, you can roast leg of lamb, ribs, whole turkey, whole and fryer chicken, vegetables, ham, fish and kabobs, just to name a few items. This page focuses on outdoor rotisserie grilling. More on indoor rotisserie grilling, go to indoor grilling. 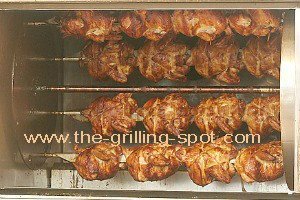 In rotisserie grilling, food is placed in a hot chamber that has a hand-operated or motorized rotating skewer also known as a turn spit. Forks, prongs or baskets can be attached securely on a spit or rod to hold food items in place. The heat source for this method of cooking can be charcoal, gas, firewood or a convection oven indoors. Most horizontal rotisseries are mounted on a charcoal or gas grill for outdoor use. Portable stand-alone rotisserie assemblies are available for outdoor adventure like camping or picnics, down to a battery-powered motor! Portable counter-top rotisseries are available with a vertical or horizontal skewer for quick and convenient indoor grilling. They are affordable too. This is a stress-free way of cooking, all you have to do is secure the food on the rotating turn spit and you are 'free as a bird'. There is not much checking and moving and flipping and turning ...... Just make sure the fire is burning right and cooking temperature is reached. You may want to do a little brush-basting, but most of the time the rotisserie food is self-basting! Use the juices dripping in the pan, if you choose to brush-baste. When the spit turns, it rotates the food at a slow speed as it cooks evenly and also bastes in its own juices. Some rotisseries have an adjustable rotating speed. A motor speed setting of 6-4 rpm (revolutions per minute) is ideal for cooking most foods. Larger meats like whole hogs are cooked at even lower speeds, 3-1 rpm. Always place your meat as centered and as balanced as possible on the spit to allow for more even cooking. Be sure to truss or tie your meat with butcher's twine. Trim excess twine with scissors. Trussing helps to avoid, for example, burnt chicken wings and legs. Avoid using cotton twine because it will burn and infuse food with a bad 'flavor'. Grillspot Tip! - Put your butcher's twine or string in a covered plastic container. Drill a small round hole in the lid and pull the string through from the inside end of the ball. This way, you only pull out the length of twine you will need without touching the rest of the ball. Rotisserie comes from old French meaning 'roasting place'. Some rotisseries have a counter weight mechanism to help balance out food items as they rotate. Naturally, all food items will not balance out perfectly on the spit as they rotate. The counterweight can be used to reduce this natural weight imbalance. If the food is not balanced around the rod, it could cook unevenly and it may cause undue stress to the motor. The heat that roasts food in a rotisserie setup should not be high or direct to avoid charring or burning the food. Instead, lower indirect heat is used to roast the food item so that it is well cooked all the way 'inside'. You can use a charcoal or gas grill for rotisserie grilling. A metal or aluminum drip pan with a little water should be placed directly under the food, in both set ups. It is even better if you can cover the lid. • First, it collects fats and juices that can cause flare-ups or extinguish the cooking fire. • Secondly, a pan with some water helps to add moisture to the roasting food. • Lastly, the position of the pan under the food helps to reduce a lot of the direct convection heat that can burn or cook on the 'outside' too quickly while the 'inside' is not cooked. Grillspot Tip! 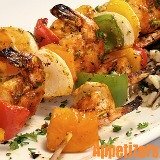 - Apply sauce in the last 15 to 20 minutes of spit-roasting to prevent excessive sauce browning or burning! Make sure your food has reached the recommended internal food temperature and cooking times on a rotisserie grill. As your food cooks, employ the use of a good quality digital food probe thermometer to ensure that your food has reached a safe internal temperature. A charcoal fire can be used to produce indirect heat for rotisserie grilling. We want to generate radiant heat that will evenly roast our foods to a crispy tasty crust. Start by lighting your charcoal using the charcoal chimney method. Keep the chimney nearby throughout the cooking session to light more coals if needed. This may be necessary in approximately 30-45 minute intervals for lump charcoal and hourly for briquettes. Using your grilling gloves, pour your hot coals from the chimney onto the charcoal grate. With the use of long grilling tongs, spread the coals to the left, the right and around the bed to create a circle called 'the ring of fire'. The idea is to leave room in the middle part of the grill to place the drip pan. Make sure the pan is big enough to cover the length of the meat. Start of by using high heat to sear meats. 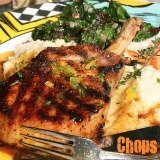 Searing helps to 'lock in' the juicy flavor. Lower the temperature accordingly for the rest of the cooking time. Temperature can be lowered by spreading the coals further away from each other. Also, open the top vents and close the ones at the bottom of the grill. Rotisserie cooking requires low steady heat to prepare our foods. Gas grills are known for instant high start-up heat. They are also not known for holding low and steady heat very well. This creates a challenge in trying to maintain the low, constant, steady heat for a domestic rotisserie. Check if your rotisserie assembly can be raised or lowered on the grill to reduce or increase direct heat. Also, with the influx of ceramic burners, designed to generate even higher heat, the challenge to maintain low, steady heat is even bigger. Commercial size gas rotisserie grilling ovens are easier to regulate because of the large number of pieces that can be cooked simultaneously. • Check if your grill has a lava burner with lava rocks. Move the lava rocks to one side to make room for a drip pan. • Pre-heat your front and rear burners on high heat. Lower the heat or turn OFF the middle burner. Lower the heat on the front and rear accordingly before placing your food. If your have a grill cover thermometer or grill surface thermometer, use medium heat, 275 to 300 °F (135-160 °C) is the recommended grill temperature. Use the rotisserie cooking chart to determine food internal temperature for some of your rotisserie foods. • If you have a burner in the area under which the spit rotates, turn it OFF or to a lower heat setting. Use medium-low, indirect heat to allow the food to cook evenly. Some new grills have a built-in motor assembly to rotate the food. After-market motors are available for 'do-it-yourself' installation if your grill does not have a rotisserie. • Take with you to the store, a traced out cardboard or paper template of the available attachment provisions and holes on your grill. • Look for a good quality and powerful motor. • Make sure the power chord is long and the motor has adjustable speeds. Every time you place your food on the spit, check the balance by loosely holding each end of the spit in the palms of your upwardly open hands. Insert the pointed end of the rod into the motor assembly and set the other end as per instructions. Turn on the motor and keep your eye and ear out for any jerking, clicking or motor stress. To correct an imbalance in the food item on the rotating skewer, place the counterweight half a turn, on the opposite side of the 'click' or 'jerk'. Work at it, adjusting the counterweight with an extra quarter turn up or down to reduce the imbalance. This will help to increase motor efficiency and evenly cook the food. Some up-market ovens have an in-built rotisserie setup or an optional provision for installation. For those that have it pre-installed, the motor itself is not visible in the oven. After the oven trays are removed, a drip pan should be installed to collect juices and for easy clean up later. Other types of indoor rotisseries are the affordable counter-top kind for indoor grilling. They are portable and have a vertical or horizontal spit. Many have multiple functional features like a touch pad controls, programmable timers with shut off, temperature presets, ready beeper and interior light. All they don't have is music... just playing! Anyway, they take up some space on your kitchen counter and have food capacity of up to 4½ lbs. The indoor rotisseries with horizontal spits are notorious for the need of perfect trussing. If not well done some parts like wings or legs drag into the pan. 1. Read the instructions manual for your grill and have a good working knowledge of your type of grill, rotisserie, features and attachments. 2. Get the rotisserie attachments, forks, prongs, skewer, baskets, drip pan, pliers, grilling gloves and foil paper. 3. Use these suggested flavoring tips and prepare the food items for roasting: brine-marinated for chicken and turkey; your favorite dry rub and garlic cloves for ribs, steaks and chops; olive oil and herbs basting for fish and seafood. 4. Use the recommendations of a cooking chart for cooking times and temperature. Employ the use a meat thermometer to ultimately determine if your food is cooked. The differences in rotisserie equipment, food size and air temperature make it hard to strictly follow a chart to know whether the food is cooked. Make sure the 'cooked' temperature is reached at the thickest part of the meat away from the bone. 5. Charcoal or Gas Grill - Keep the lid closed most of the time for even cooking. 6. Add water or beer to a drip pan, if possible, to add flavor and keep your food moist. Also consider basting at intervals with a mix of olive oil and fruit juices. 7. Use foil paper to wrap your meat if it seems to be burning or cooked on the outside before it is fully cooked on the inside or reached the recommended internal temperature. 8. Prepare a side table or area with a chopping board and carving knife and pitch-fork. 9. Use oven mitts or grilling gloves to remove the spit from the grill. 10. Enjoy your food, roasted to a perfect crisp crust! ‡ Measure min/lb to roast for other weight not specified in chart. † Number of stuffing cups for poultry. Add extra 15 min on clock. Δ 'Done' poultry should be tender and no longer pink. Grillspot Note! - Grilling times are for a covered grill. Add 20 mins for an uncovered grill. When internal food temperature is reached before cooking time, stop roasting. Let food rest for 10-15 minutes before carving or serving. Enjoy!